I was three years from being born when Long Island hip hop group Public Enemy released Yo! Bum Rush The Show. During the late 1980s en early 1990s, Chuck D, Flavor Flav, Professor X and Co. would put out classic after classic. Or what else would you call It Takes a Nation of Millions to Hold Us Back (1988), Fear of a Black Planet (1990), and Apocalpyse 91... The Enemy Strikes Black (1991)? One could argue that with these albums P.E., fuelled by their anger against the political machine, had the greatest four-album run in hip hop history. 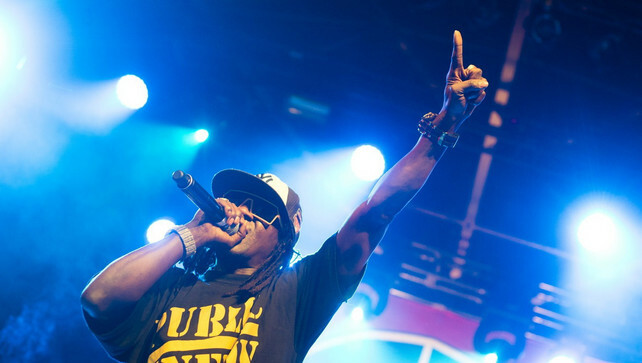 Over the years Public Enemy would only further add to their catalog, putting out 10 more albums between 1992 and 2012, which landed them in the Rock and Roll Hall of Fame in 2013, making them the fourth hip-hop act to be inducted after Grandmaster Flash and the Furious Five, Run-DMC, and The Beastie Boys. Your circle says a lot about you, and all that. With a catalog that dates back more than 25 years, Chuck D. (54 years old) and Flavor Flav (56 years old) could very easily retire and enjoy their money, but that's not what the rap veterans are about. In light of the turmoil in the African-American community, the group recorded Man Plans God Laughs, their 13th album and first in the last three years, proving that P.E. 's sociopolitical commentary is as relevant as ever. When they were announced to perform at Rivierenhof, I did not hesitate, and decided to go check them out. From opener Miuzi Weighs a Ton to closer Shut 'em Down, the still very much vivavious Rock Hall of Famers proved real crowd-pleasers, with beclocked hype man Flavor Flav leading the way. He danced, jumped, rapped, played bass, manned the drums, and brought a lot of energy and enthusiasm to the concert.